This morning, state prosecutors rested their case in the criminal theft trial of Mayor Sheila Dixon. Nearly twenty witness were called--but developer and former boyfriend Ronald H. Lipscomb, whose testimony was believed to be key in the Mayor's prosecution, wasn't among them. This morning, state prosecutors rested their case in the criminal theft trial of Mayor Sheila Dixon. 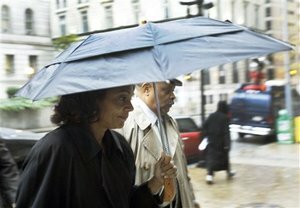 Nearly twenty witness were called–but developer and former boyfriend Ronald H. Lipscomb, whose testimony was believed to be key in the Mayor’s prosecution, wasn’t among them. Without Lipscomb’s testimony, intrinsically tied to the gift card scandal that has dominated the case against Dixon, the judge was forced to throw out two of the seven counts against Dixon. What will become of the case against Dixon without the gift card scandal? How will the conversation around the Mayor change if she is acquited? We talk with reporters and commentators with a variety of perspectives about where the trial might go from here. Please note this conversation continues into our second hour, available here. Don’t miss out!